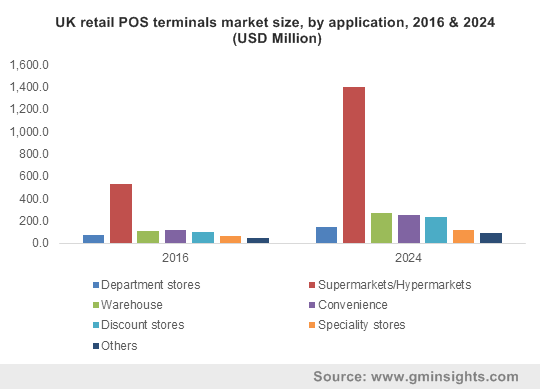 Retail POS Terminals Market size was estimated at over USD 15 billion in 2016 and is predicted to grow at over 10% CAGR from 2017 to 2024. Government efforts to promote digital payments is largely contributing to the growth of the retail POS terminals market. Cash based payments have reduced massively over the years and are being continuously replaced by cashless forms of payments such as debit cards, checks, and credit cards. A federal reserve study in 2016 indicates U.S. non-cash payments are estimated to have totalled to more than USD 178 trillion in 2015 and this trend is anticipated to continue during the forecast timespan. Various online payment channels and portals have created a secure platform to boost the convenience and ease of use and eliminate instances of frauds and data thefts. In developed regions, the rising demand for self-checkout services is impacting the retail POS terminals market. These kiosks reduce the waiting time of customers and decrease the dependence on staff; freeing them to perform other important tasks. Self-checkout kiosks consume less outlet space and free up space for product displays. IT security breach and identity theft hinder the growth of the retail POS terminals market. Rise of cloud based systems will further threaten the consumer data privacy offered by these systems. POS terminals hold multitudinous amounts of payment card information and other confidential data can hamper the security and, in extreme cases, cause major damage. Several malware families such as ALINA, Dexter and vSkimmer are primarily used for attack on POS systems. EMV card chips have a special encryption key that enables secure transactions to be initiated and reduce the threat of theft and this information is held in the magnetic stripe. The fixed segment of the retail POS terminals market is anticipated to dominate in terms of revenue during the forecast timespan. The technology provided by retail POS vendors is anticipated to evolve to cater to the needs of the customers. POS systems can be configured with options such as biometric reader, touchscreen display, magnetic stripe reader and biometric reader. Substantial adoption of mPOS systems in large retail chains is expected over the forecast timespan. These are very useful for merchants who operate in out-of-store environments. mPOS systems allows a retailer to keep their customer engaged and interested in the products of their preference. mPOS systems can also substantially reduce the customer waiting time and are anticipated to be a major factor driving the retail POS terminals market. Merchant fees to financial institutions for transactions on debit, Visa and MasterCard have also gone through massive reductions propelling the retail POS terminals market growth. The shift towards EMV cards is fuelled by the rising instances of unsafe payments, security thefts, and frauds. In the present day, most retail stores have an EMV card reader at their POS cash registers. These protect the user from frauds and are harder to clone due to the usage of dynamic authentication which incorporates unique information in each transaction. In October 2015, payment network policy started requiring financial institutions and businesses in the U.S. to adopt secure payment solutions by transitioning away from magnetic stripe cards. Adoption of hardware interface standards is anticipated to positively impacted the retail POS terminals hardware market during the forecast timespan due to the widespread utilization across various industry verticals. The manufacturers are constantly updating the hardware and mobile options to provide access to cloud services and better cater the requirements to suit the varying customer business demands. The software component of the retail POS terminals market is witnessing wide adoption in the retail and hospitality sectors to provide functionalities such as monitoring of the process and getting insights on the customer behaviour which enables the retailers to increase their revenues accompanied with providing payment solutions. technological advancements such as the integration of biometric systems is anticipated to fuel retail POS terminals market demand. These devices protect retailers and customers against the fraudulent transactions. Supermarkets and hypermarkets will gain retail POS terminals market demand due to the high user traffic in these locations and long waiting times that can hamper the user experience. Furthermore, rapid industrialization has led to the large-scale construction of supermarkets and hypermarkets causing a high demand for fixed and mobile systems. To ensure that the client experience remains smooth, supermarket owners are increasing their number of check-out counters and integrating faster swiping and tagging equipment. The warehouse application segment of the retail POS terminals market is anticipated to witness significant growth due to the speed and accuracy of the devices which helps in fastening the process. These terminals provide a detailed view of inventory and send alerts and fore-warnings when a product is running low. They also keep a check on the stock before the season begins. Key companies in this sector are obtaining several benefits through implementation of POS terminals, which help them accelerate product development, improve customer service, optimize production, marketing and enhance the value chain. The demand for retail POS terminals market in the Asia Pacific region is anticipated to be very high during the forecast timespan. Government initiatives such as the demonetization strategy in India is anticipated to drive the regional share. During the transition to new currencies, there was a massive shortage in physical money causing the general population to shift towards the digital platform. Additionally, the retail sector in the region is currently booming. The U.S. retail POS terminals market contributed largely to the global revenue in 2016. Cloud based POS systems are predicted to experience high demand owing to the accuracy, reduced manpower, in depth insights, and inventory management that it provides. Furthermore, this technology can be easily updated and is predicted to gradually replace conventional legacy systems. Brand loyalty amongst business owners has caused vendors such as Apple and Square to retain customers and expand their business. The vendors in the retail POS terminals market include Cisco Systems Inc., NCR Corporation, Ingenico Group, PAX Technology Inc, Hewlett-Packard Company, VeriFone Systems Inc., Samsung Electronics Co., Ltd., Panasonic Corporation, etc. Business strategies such as partnerships and acquisitions are commonplace in the retail POS terminals market. For instance, in December 2016, VeriFone announced that it has joined hands with MasterCard to roll out a new payment application for retailers across the UK. Companies also invest highly in R&D to sustain growth. In August 2017, the company announced the launch of the HP ElitePOS. The system is a versatile all-in-one retail POS with a modular design to cater to the growing e-commerce segment. The retail POS terminals market enables business owners to exercise higher control over their operations. These systems are not limited to only cash payment and financial payments, but also provide a range of other applications such as inventory management, collection of customer data, and insights into customer purchasing trends. The growth in global economic conditions has led to an increase in disposable income of the middle-class population. This is causing higher consumption rates on high-end luxury products. The retail sector across various economies is also anticipated to experience high annual growth. Small players in the market compete by selling unique merchandise, offering a distinctive shopping experience, providing superior customer service, and serving local market. On the other hand, the large players benefit in purchasing, distribution, and marketing, owing to high investment capacities due to large scale of operations.